Which Smartphone Apps are the Biggest Data Hogs? Studies suggest that Android users consume the most data--which is great news for the tech industry, but perhaps not so great for the user who has to pay that pesky wireless bill at the end of each month. As 4G networks become more popular and unlimited data plans drop like flies, it's important that you know how to cut down your data usage without seriously compromising your mobile Android experience. Here are a few tips to help you track and reduce your data usage so you can avoid overage charges and data throttling. The first step in reducing your data usage is figuring out how much data you actually use. You can check your data consumption as measured by your phone (which may be slightly different from what your carrier thinks you're using) by digging into your wireless settings menu. For the purposes of this guide, we're using a Samsung Galaxy Nexus running Android Ice Cream Sandwich (Android 4.0.2), but some of these tips may work differently depending on what phone you own and which version of Android you have installed. Open your Settings menu and navigate to Wireless & Networks, Data usage. Here you can see how much data you've used during your current billing cycle, set a mobile data limit that will disable your mobile data connection at a certain point, and view a list of apps that use data and how much they consume. 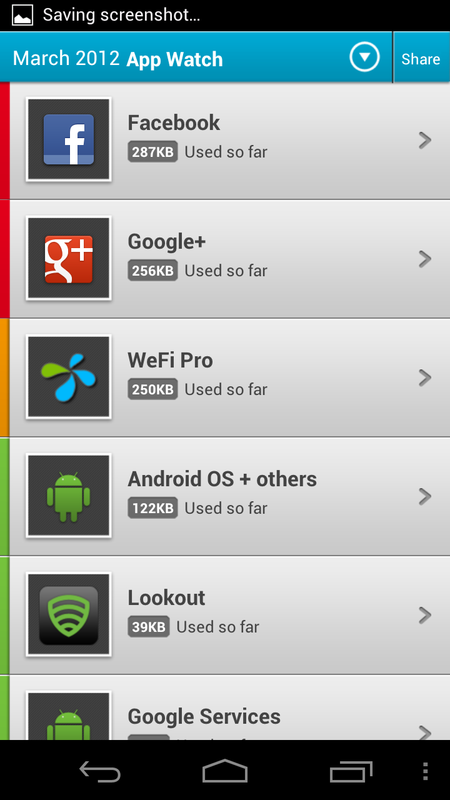 Onavo tells you which apps use the most data. You can also monitor your data usage via third-party apps like Onavo, or carrier-specific apps like Verizon's My Verizon or AT&T's myAT&T. The primary benefit of using a carrier-specific app is that your carrier will always have the most accurate estimation of how much data you'll be charged for. If your carrier doesn't offer a data usage app, or if you want an app that has more features, Onavo is a free data-monitoring app for Android that lets you do the usual--set a data cap, see a breakdown of which apps use the most data, and see how much data you've used in any given cycle. Onavo also employs proprietary algorithms to analyze your data usage and let you know whether your data plan is a good fit for you based on that usage (the default Android data usage tab does not analyze usage). Most of these features are also available as Android home-screen widgets that make it easy to monitor data usage at a glance. Here's a quick and easy way to cut data costs: If you're not using all of your data each month, move to a lower plan. To determine whether you should move to a lower plan, either analyze your data usage for a couple of months using the aforementioned data-usage apps, or calculate how much data you'll need with a usage calculator. During PCWorld's smartphone data usage tests, we found this data usage calculator from Verizon Wireless to be fairly accurate at determining how much data we needed per month. You can also find data usage calculators at other carriers' sites: AT&T, Sprint, and T-Mobile. You can also minimize how much cellular data you use by connecting to Wi-Fi networks whenever they're available. But it can be a hassle to find and connect to unknown Wi-Fi networks on your Android phone, and it usually involves opening your Settings menu and trying unsecured networks one after another to see if they work. Luckily, you can (sort of) circumvent this annoyance by using a free Wi-Fi finder app, such as WeFi Pro or WiFi Manager. WiFi Manager shows you what channels nearby Wi-Fi networks are running on. WeFi Pro is a background app that automatically connects your Android device to the best available Wi-Fi network. WeFi has a couple of useful things about it: First, it's a "social" Wi-Fi finder, which means that whenever a WeFi user finds a strong, open Wi-Fi connection, that hotspot is logged in the WeFi database. Second, WeFi has the ability to turn on your Wi-Fi automatically (not always a good thing) if you're near a known good connection or if you do something that would benefit from an Internet connection (opening a webpage, for example). If you're willing to trust WeFi with control of your Wi-Fi radio, it's a great way to ensure that you're always taking advantage of Wi-Fi at home or at the office. 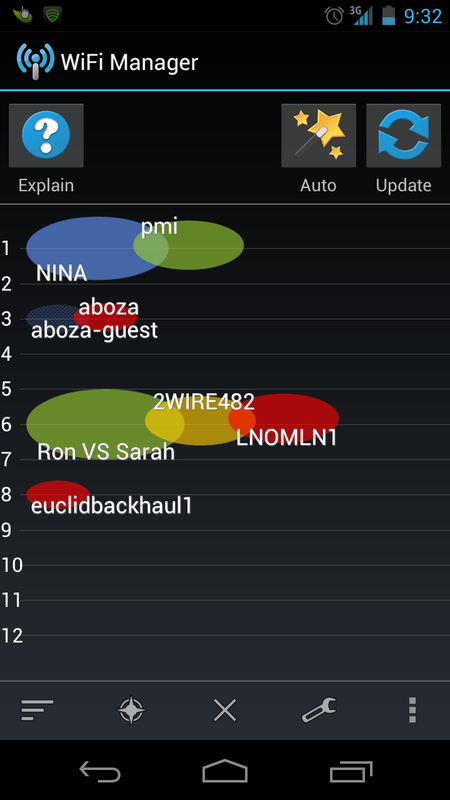 WiFi Manager is a more typical Wi-Fi finder. It shows you a list of available connections, along with signal strength and status. It also has a radar mode, which shows you which channels nearby Wi-Fi networks are running on. This is useful for two things--determining if your Wi-Fi router is running on a congested channel (learn how to change your router's channel here), and determining which open network is likely to be the fastest, based on how many other routers are running on the same channel. A lot of free Android apps--especially games--use ads to help support themselves. Unfortunately for you, this means that apps which normally don't use data must connect to the Internet to download and refresh ads. Ads are also a data-draining (and generally annoying) part of many webpages. Eliminate ads, and you will cut down the amount of data you consume each month. You can get rid of ads in a couple of ways. First, you can purchase the Pro or Paid version of the apps responsible for the lion's share of your monthly data usage (see our earlier tip about Onavo). Second, you can use an ad-blocker app like AD Blocker & Data Toggle ($2, for normal, un-rooted Android phones) or AdFree Android (for rooted Android devices). But remember that blocking ads from downloading probably decreases ad revenue for the developers who made the ad-loading apps--which are free because they're ad-supported. Opera Mini compresses webpages to reduce your data usage. You use a lot of data when you browse the Web--but you don't have to use as much as you do. Instead of using the stock browser that comes with Android, try downloading a lighter and more data-efficient browser such as Opera Mini or TextOnly to reduce your data usage while surfing the Web. Opera Mini is a free and speedy little mobile browser that compresses websites before sending them to your Android device in order to reduce your data usage. Opera Mini is also available on iOS and features tabbed browsing, "Speed Dial" websites, and automatically adjusting page sizes to make your Web browsing experience faster and more efficient. If you really want to be efficient and don't need to see pictures while you're surfing the Web on your Android smartphone try TextOnly, which is just what it sounds like -- a text-only browser. 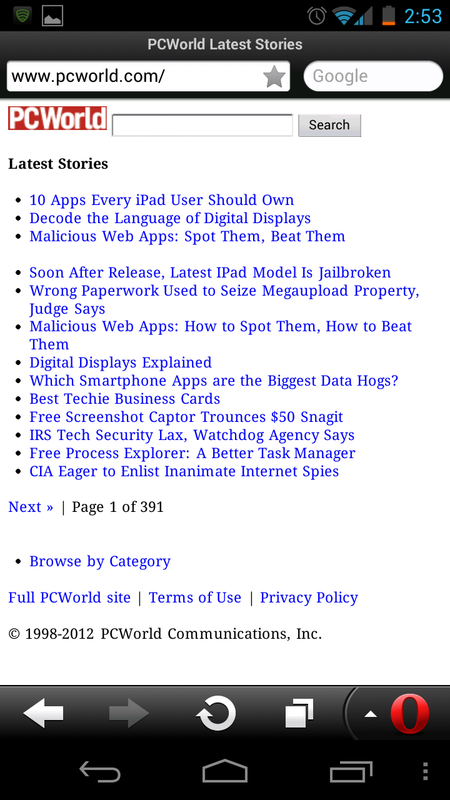 TextOnly is free to download and will display only the readable text on most of your favorite websites, though if you happen to come across an article that really requires pictures and/or video you can always select the "View the original" option to see the full article in all its glory. Next: Use Offline Maps, and more.